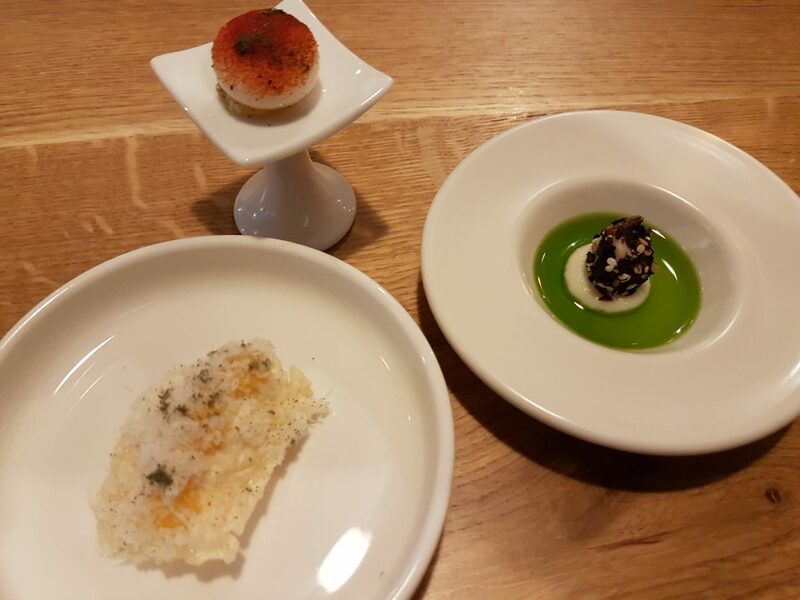 Mono’s stated aim is progressive Italian dining. If it sounds like a bland political manifesto from the last election, the reality is anything but. 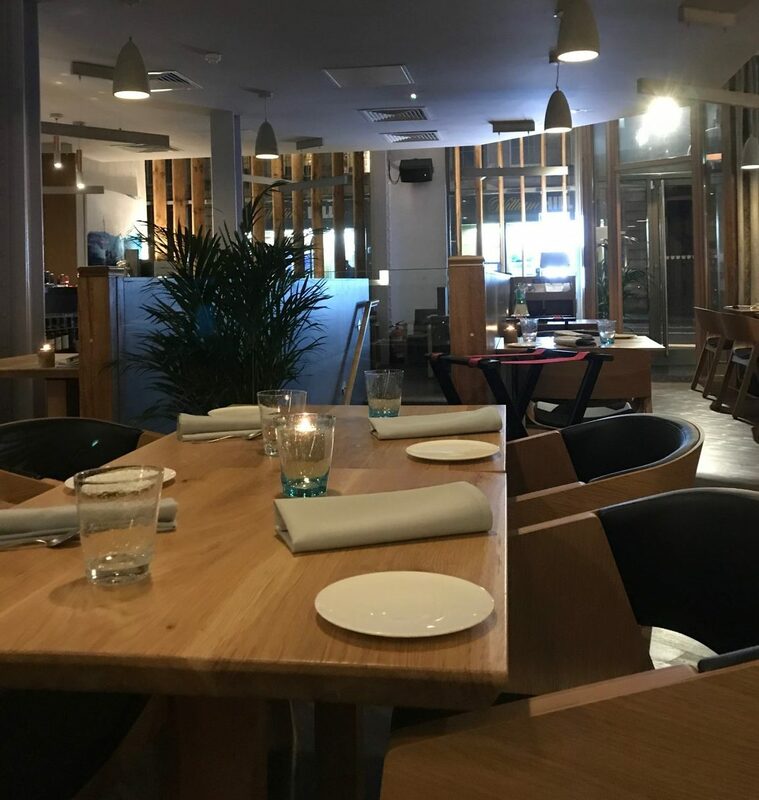 The restaurant is a partnership between talented chef Maciek Zielinski and Italian restauranteur, Joseph Crolla. The result is Italian food but not as we know it. 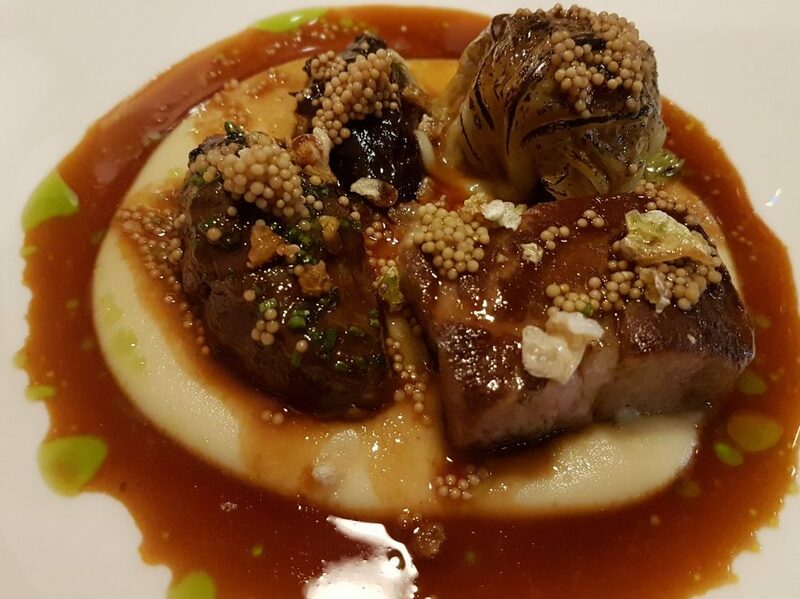 The location is the first surprise – South Bridge is a bit of a stranger to fine dining. Walking along this frantic street into the restaurant feels like going through the looking glass. You step into an oasis of Zen-like calm where a team of charming staff await to take you on a Romantic culinary voyage of discovery. The spacious restaurant is on two floors with the open kitchen downstairs. They achieve a warm and welcoming space with minimal elegant styling. Their k.p. also deserves a mention for coping with the incredible array of plates that play hosts to some exquisitely presented food. The wine list has been curated by the team and focusses on their favourite small producers. It feels all the more personal because of this. We picked a light and zesty Bertani Soave from the Sereole vineyard, Veneto (£28) which is at the cheaper end of the list. We ordered from the à la carte menu that offers six choices for both starters and mains. They also do 2, 3, or 6 course set lunch menus, an aperitivi menu and a tasting experience menu. A selection of bite-sized stuzzichini are perfectly formed spoiler-alerts for what’s to come. Chef’s take on a caprese salad is a gentle explosion in your mouth. The next bite is a fried parmesan crusted pasta with a pumpkin centre dusted with parsley dust. The final mouthful even makes cauliflower seem exciting. A charred floret sitting on purée surrounded by a puddle of vibrant green spring onion olive oil. Mono celebrate Italy’s regional bread heritage with a fine selection along with Sicilian olive oil. The good news is that you get a dish each so no fighting over the last grissini. 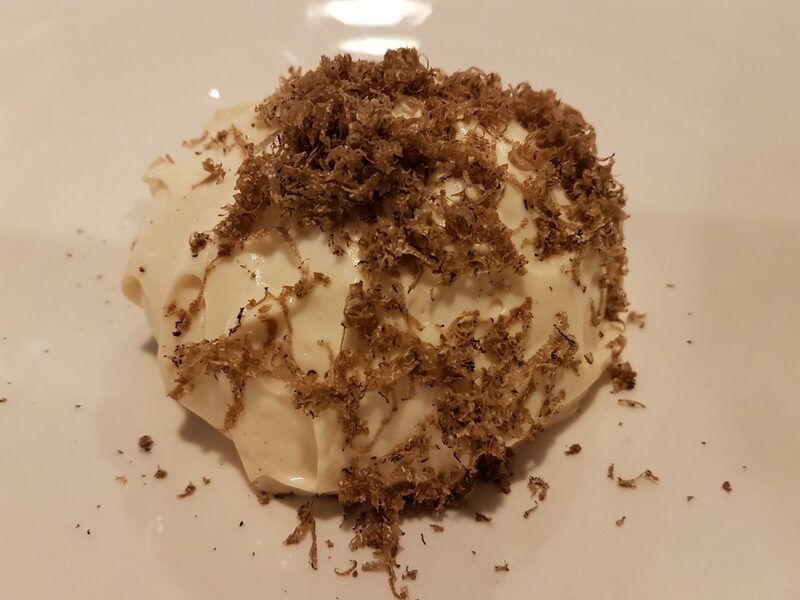 My dish arrived looking like a beautiful white chocolate truffle. 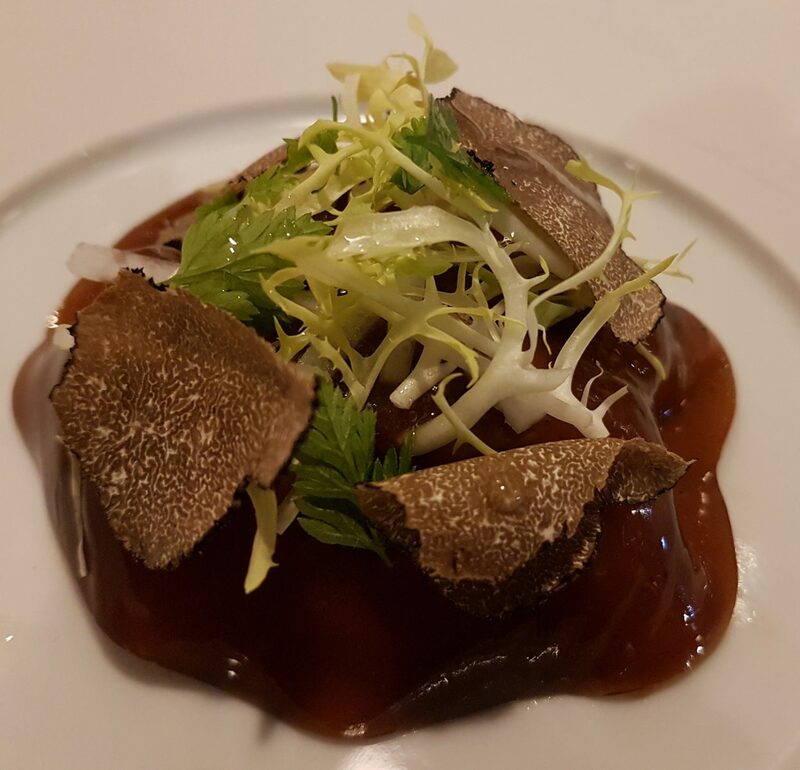 Inside the creamy exterior is baked artichoke with a rich duck egg all dusted with Autumn truffle shavings. 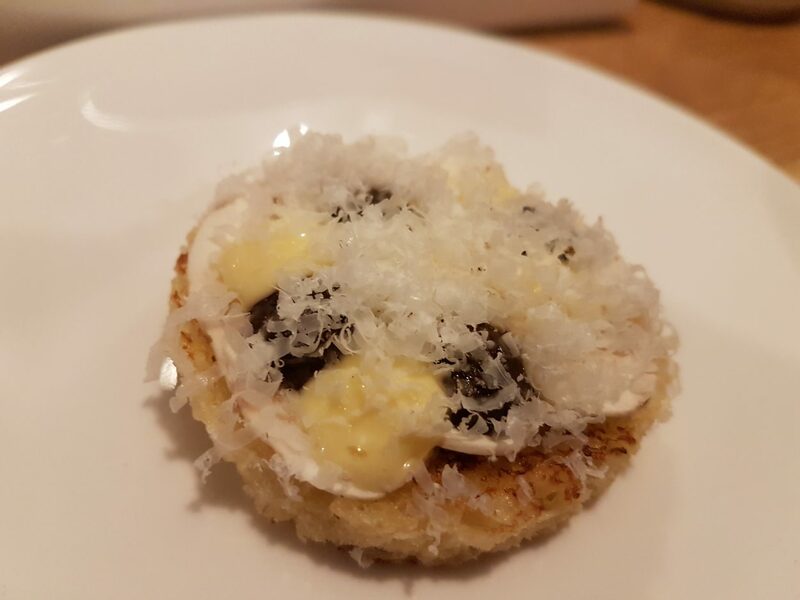 The dish is served with a separate blini topped with mushroom and parmesan. It’s a little awkward to eat but well worth the effort. Donnie’s starter of brown crab completely defied expectations. The delicate meat is hidden under a tart apple jelly infused with black tea. Sticks of kohlrabi add freshness and slivers of truffle an earthy Autumnal flavour. I decided to go full Italian and try the gnocchi. The soft dumplings are stuffed with a deliciously sharp gorgonzola filling. 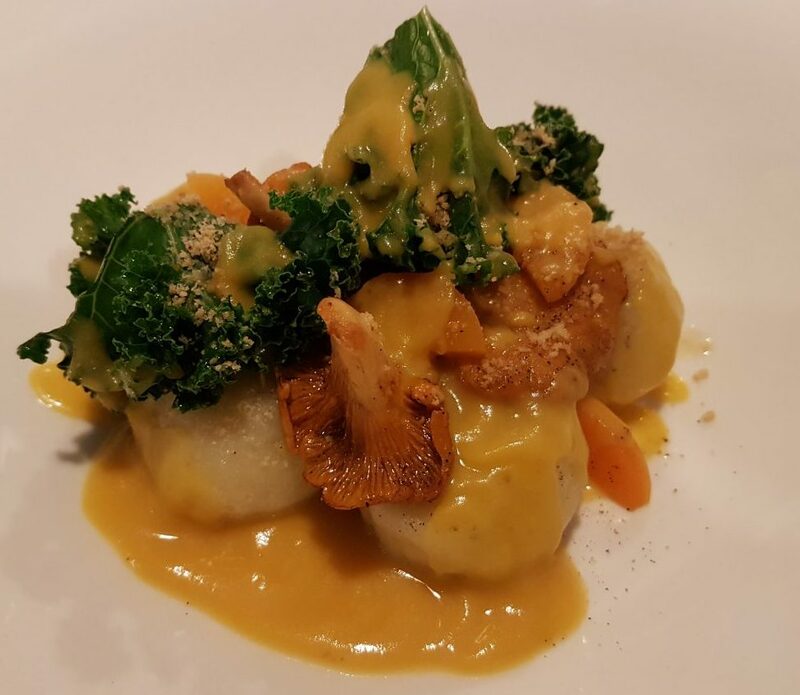 Chanterelle mushrooms, kale, pumpkin and a scattering of hazelnuts couldn’t be more seasonal if they tried. It’s a delicious dish. Donnie’s hearty cumin pork dish features neck, tender cheek and a few other piggy parts wrapped in a cabbage leaf. Prunes add a wonderful sweetness to the intensely rich flavour. The meat is meltingly tender and served atop creamy celeriac with scatterings of crispy capers and mustard seeds. Sicily beckoned for dessert with cannoli stuffed with sweet ricotta and chocolate dipped in toasted pumpkin seeds. These deep-fried treats were served with syrupy poached pears and a blob of tart yoghurt. It’s a hands-on dessert that explodes over the plate in a deliciously Italian mess. Donnie’s head was played with again for his plum tart dessert. A candy crisp chocolate shell gives way to a layer of ricotta cream topped with a tender plum compote. 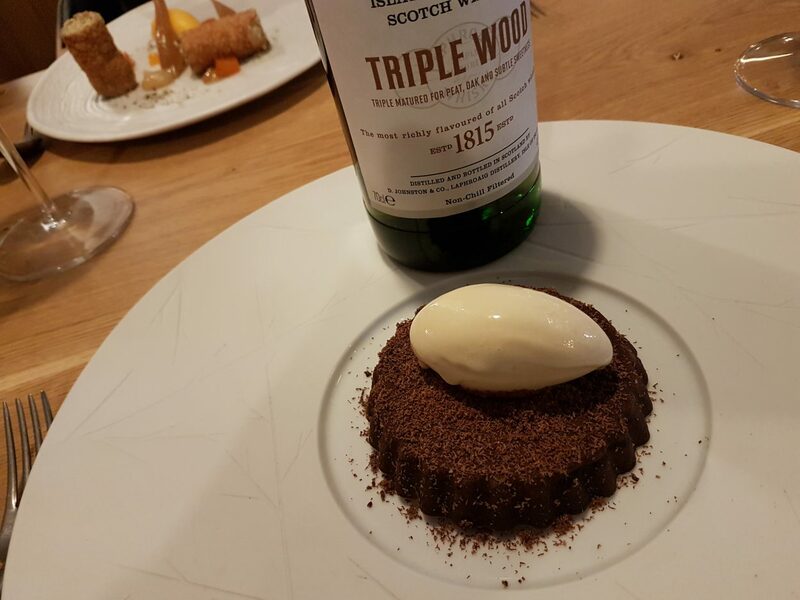 The dish is finished off in dramatic style with a couple of sprays of peaty Laphroaig from an atomiser. It’s a stunning dessert and one of the finest Donnie has eaten. A visit to Mono isn’t dull or predictable. The menu takes you on an exciting topsy-turvy tour of Italian flavours and culinary heritage. 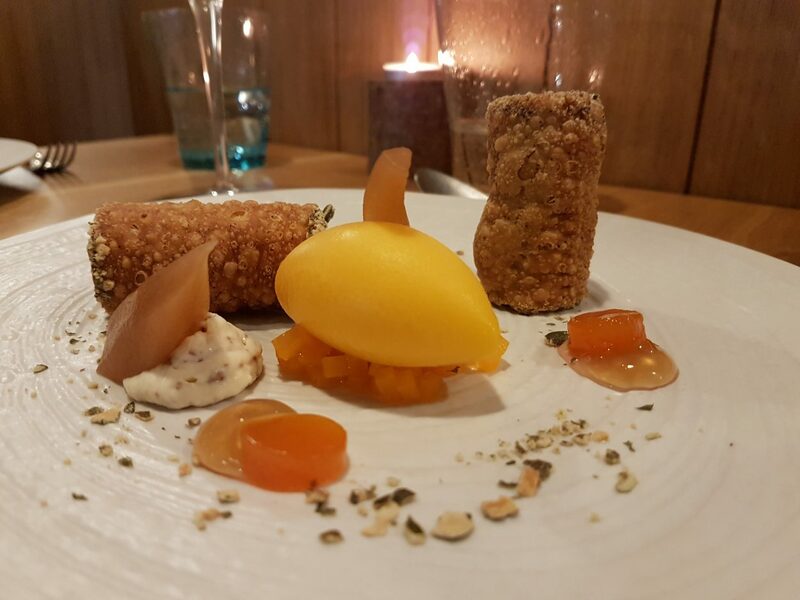 If you are looking for an evening of surprises, inventive cooking and unfussy service then head to South Bridge and experience Mono for yourself. A huge thanks to MONO for inviting us along to check out their new restaurant.